So the theme of these summer recipes is, not summer recipes! The next thing you know I’ll be posting recipes for Christmas pudding and Santa shaped shortbread. But I’m not quite there right. 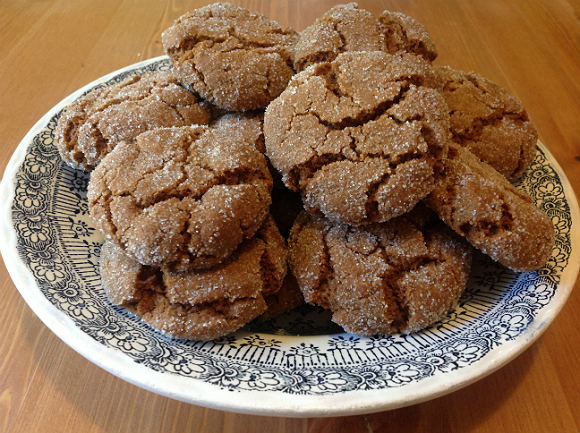 Next up, ginger cookies! I love the taste of ginger cookies so much. These ones are the best mix of crispy and soft, like the perfect cookie should be. These may have fall flavours but heck, you can buy them year round at Starbucks so I say they are as much an any day cookie as chocolate chip. Also, these are best a little under cooked. Trust me. Enjoy your long weekend Monday! Using egg beaters or a stand mixer, mix the first six dry ingredients with the butter substitute until well combined. Add in the brown sugar. Mix in the egg made with egg substitute and molasses until completely combined. Roll the dough into tablespoon sized balls and roll in the white sugar until lightly coated. Place on wax paper about 1 inch apart. Bake for 10 minutes, keeping an eye on them so they don’t get to crispy.Remove from the over and eat ’em up. Love it! And I like your blog’s vintage recipes!